Background: Bennie Dean Herring was arrested in Coffee County, Alabama after trying to pick up his impounded car from his local police station. While he was at the station, the county investigator asked for a check for warrants in Herring's name. While none were found in Coffee County, the warrant clerk learned that there was a warrant on Herring in a neighboring town. He was subsequently arrested and faced additional charges for drugs and a gun possession. Minutes after his arrest, though, Coffee County police learned that the warrant in the neighboring town had been previously recalled. Herring argued that the drug and weapon charges should be inadmissable because the arrest was unlawful. The district court and appeals court denied his request to suppress the evidence. What's at Stake: The pertinent issue in Herring's case is whether evidence should be the excluded if it is obtained during an arrest precipitated by what seems to be correct information given by another law enforcement agency, but in fact is erroneous. In hearing this case, the Supreme Court will revisit the Fourth Amendment right to reasonable searches and seizures. Background: Diana Levine of Vermont used the anti-nausea drug Phenergan, manufactured by pharmaceuticals giant Wyeth, via intravenous injection as had been approved by the FDA. The drug came into contact with Levine's arterial blood, causing gangrene; most of her arm eventually had to be amputated. 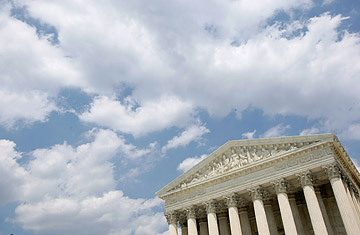 Though Wyeth had recommended "extreme care" in the use of Phenergan intravenously, the Supreme Court of Vermont ruled that Wyeth could have, and should have, prohibited the use of Phenergen through IV on its labels. Wyeth was not barred from making labeling changes to do so after the FDA's approval was initially granted. What's at Stake: With thousands of similar cases flooding the judicial system regarding federal labeling mandates versus state labeling procedures, this case would provide guidance to federal and state judges. Background: In 2004, the FCC tightened its policy regarding expletives that had made it on-air during live broadcasts, prohibiting "single uses of vulgar words" where it had previously made allowances for "isolated and fleeting" incidents. The Commission cited three incidents as examples: Fox's 2002 and 2003 broadcasts of the Billboard Awards and NBC's 2003 broadcast of the Golden Globes. In 2006, the FCC issued an "omnibus order" reiterating its ban on single-use violations. Fox complained to the Second Circuit Court, citing the First Amendment, and the Court struck down the FCC's ruling as arbitrary. What's at Stake: In striking down the FCC's ruling, the Second Circuit Court essentially calls for the Commission to choose "between allowing any free use of any expletive no matter how graphic or gratuitous, or else adopting a (likely unconstitutional) across-the-board prohibition against expletives." The Supreme Court  should it decide to address the case after oral arguments  will have to decide if the FCC has the right to enforce its new policy under federal communication law. Background: Javaid Iqbal, a Pakistani man living and working in New York, was arrested on credit card fraud charges after the Sept. 11 attacks. While in custody in the maximum security section of Metropolitan Detention Center, Iqbal allegedly received "gross mistreatment." After being deported, he filed suit against the prison and FBI Director Robert Mueller and former Attorney General John Ashcroft, claiming multiple civil rights violations including that the officials "designed, or at least approved of, a policy of segregating Arab and Muslim detainees from the general prison population until individually cleared of suspicion by the FBI." The U.S. District Court of New York dismissed most of his claims, which the U.S. 2nd Circuit Court of Appeals affirmed in June 2007. But the Appeals court also found the parts of Iqbal's argument alleging the involvement of Mueller and Ashcroft to be plausible. Among Iqbal's evidence: a memo from Ashcroft sent to subordinates "outlining how the classification system for Arab and Muslim detainees would be carried out." What's at Stake: Defining the proper procedures for identifying and interrogating suspected terrorists is a major issue for the U.S. government today, and it factors heavily in the philosophy behind this case. Arguably more important is that a decision in Iqbal's favor would open the floodgates for further cases questioning the right to immunity of top government officials.